In the Tibetan Lunar Calendar, generally the full moon falls on the 15th day and new moon falls on the 30th day of the month. These days of the month are considered auspicious and Bay Area Pal Tsechen Ling observes them by hosting prayer sessions followed by vegetarian dinner. 2018 prayer sessions held at our center are listed below. New moon prayer session lead by Khenpo at our center. His Holiness Sakya Trinchen Rinpoche will grant a Maha Guru Empowerment and Dharma Talk. Register before July 20, 2018. 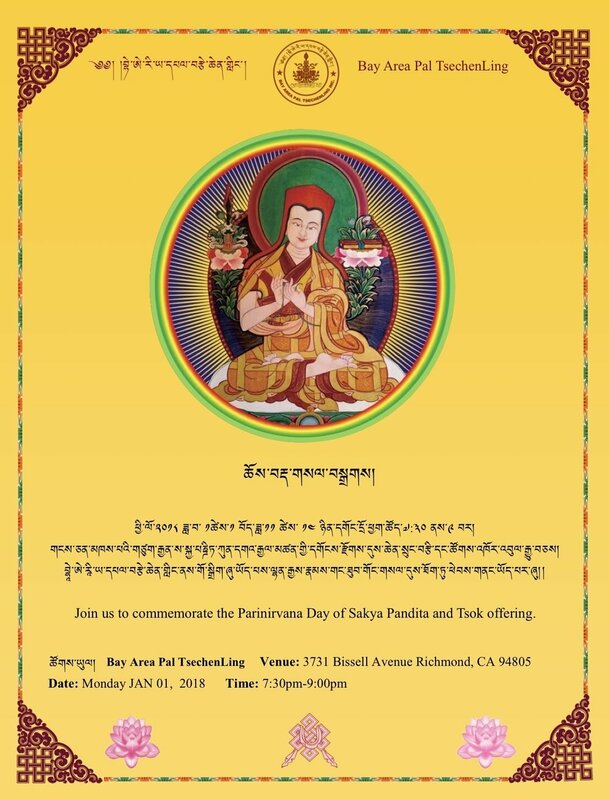 His Eminence Avikrita Rinpoche will be visiting San Francisco Bay Area on 3rd day of Tibetan Losar and we are honored to celebrate this day with him and receive blessings from him. Details are listed below on the flyer. Prayer sessions lead by our resident Khenpo followed by vegetarian dinner. Please come and join us to commemorate the Parinirvana or complete Nirvana day of Sakya Pandita.